Summer Art Camp for grades 2-6 at the beautiful Coastal Arts Center. 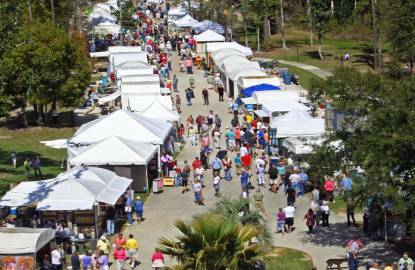 For more than 45 years, the Festival of Art has been our island's first rite of spring. It is a celebration of visual, performing, musical and culinary arts. With more than 100 artists working in a dazzling variety of media, festival-goers always have plenty to see, hear, touch, taste and experience. Fine Artist applications accepted August 1 - October 31, 2019 through Zapplication.org. ALL OTHER VENDORS are by invitation only. This fine arts festival is completely FREE with music and entertainment featured on two stages. PARKING: The Wharf west lot, and OB City Hall area, with shuttles provided by B.R.A.T.S. for a $5 daily rate. Parking for guests approaching from east Orange Beach (Bear Point, Caswell, etc.) is at the Orange Beach Presbyterian Church. CONGRATULATIONS TO OUR 2018 SHOW WINNERS! The Friends of the Arts, Inc.
Sea Oat Studio Jeanne & Vince Duffy Kathy & Ricky Lindsey Gwen & Fred Lowe Rebecca & Patrick Murphy, The Ben Murphy Co.
Buying your art through this program provides support to both the fine artists and the performing artists, and brings you recognition in our community. For complete details and to access the purchase form, click HERE.